The Amalfi Coast is one of Italy’s premier tourist destinations—and rightly so. Stretching more than 64 kilometres from Sorrento to just before Salerno, this UNESCO World Heritage site is a beach-goer’s paradise, characterized by pristine sand, pebbled coves and deep blue shades of Mediterranean Sea. Its quaint fishing villages look like they’re straight out of a postcard—colourful houses stacked atop each other, making you feel like adding just one more would topple the whole thing over like a house of cards. Basing ourselves in Salerno gave us plenty of flexibility to explore hidden gems in neighbouring towns. From Salerno, you can also hit Amalfi’s iconic stops like Capri or Positano, as ferry and bus connections are quite frequent. But this time around, we opted to visit a small town called Vietri Sul Mare, known as the “first pearl of the Amalfi Coast,” just a couple of bus stops away from Salerno. The helpful receptionist at Ostello di Salerno, our convent-turned-hostel (a truly unique Italian experience), told us it had a lovely beach and seafront, but she neglected to mention the town’s most overwhelming feature. 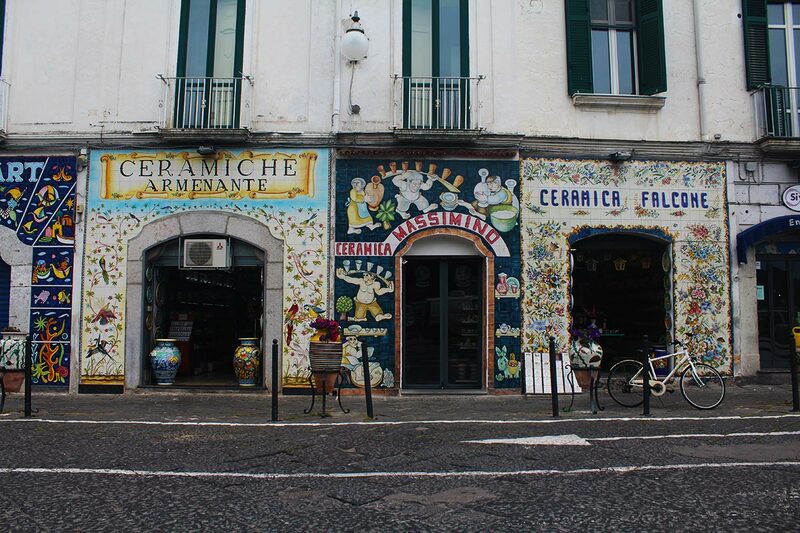 Vietri’s storefronts are covered with ceramic tiles. As soon as we stepped off the bus, the dazzling ceramic tiles were hard to ignore. They covered the façade of every building in town, with intricate mosaics sprinkled on sidewalks, park fountains, plant pots and even garbage cans. The craftmanship was impeccable. Inside ceramics stores, masterpieces ranged from tiny topped wine corks to limoncello shot glasses and giant vases. 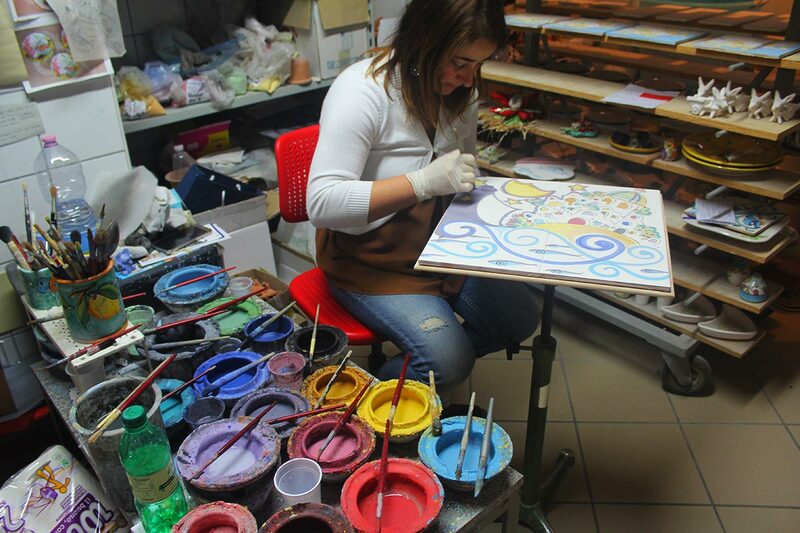 Each item was expertly hand-painted, maintaining the region’s centuries-old tradition. “I’ve been working with ceramics since I was 15 years old,” Cosimo D’Urso, one of the town’s most well known artists, told us. 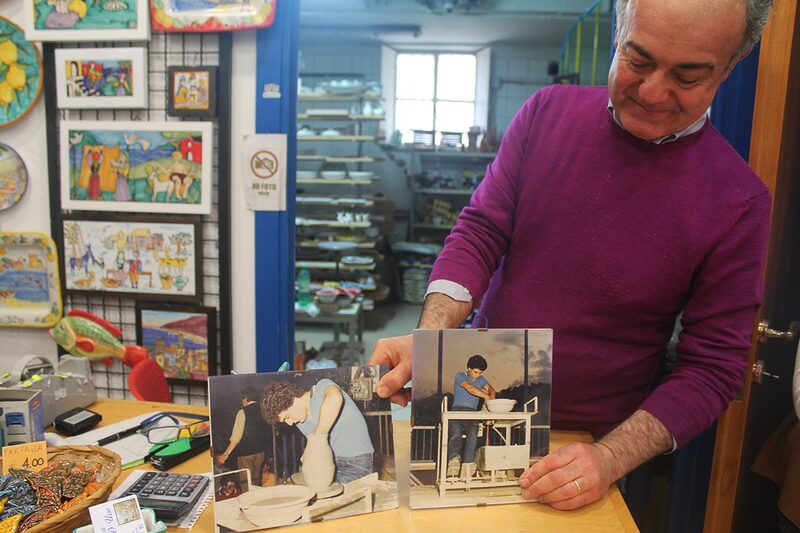 Tucked away behind his store, Ceramica D’Urso, there is a small studio space where visitors can catch a glimpse of the meticulous labour involved in creating his art, which he sells in store and by commission. Cosimo D’Urso has been working with ceramics since he was 15 years old. First they shape the clay, then they place it into the kiln, plunge it in a glaze (called smalto), put in the kiln again and, finally, paint it by hand. But we’re only seeing a fraction of the work: D’Urso makes smaller pieces here, but needs a larger studio for bigger ones. “In my work, you can see several themes from our region’s ceramics,” he said. For example, some pieces represent a donkey, which is Vietri’s ceramic symbol—when Germans arrived in Vietri in the first half of the 20th century, they were intrigued by the town’s use of the animal for transport. 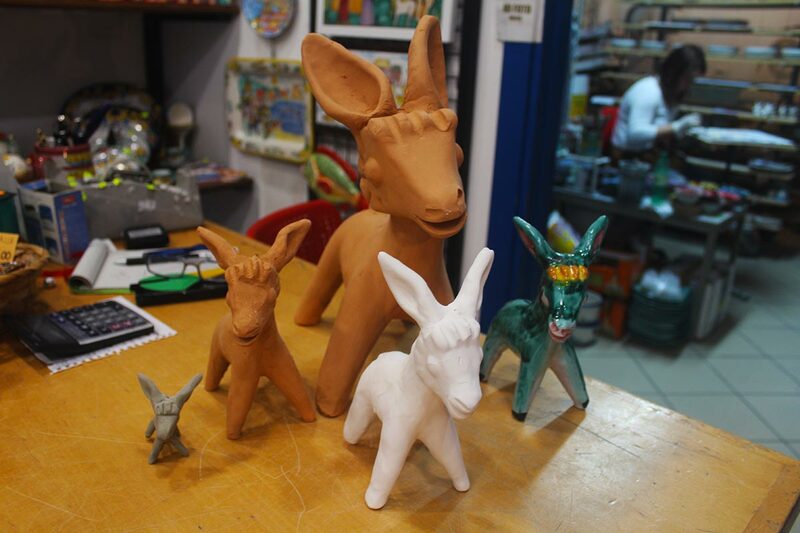 The life cycle of a ceramic donkey, from mold to glaze to paint. Besides other local animals and marine life, artisans also emphasize lemons, geometric patterns and ceramic shapes influenced by pots found here centuries ago from Arab cultures. With a new twist on traditional designs, as D’Urso does, the craft becomes essential to maintaining their Mediterranean identity. 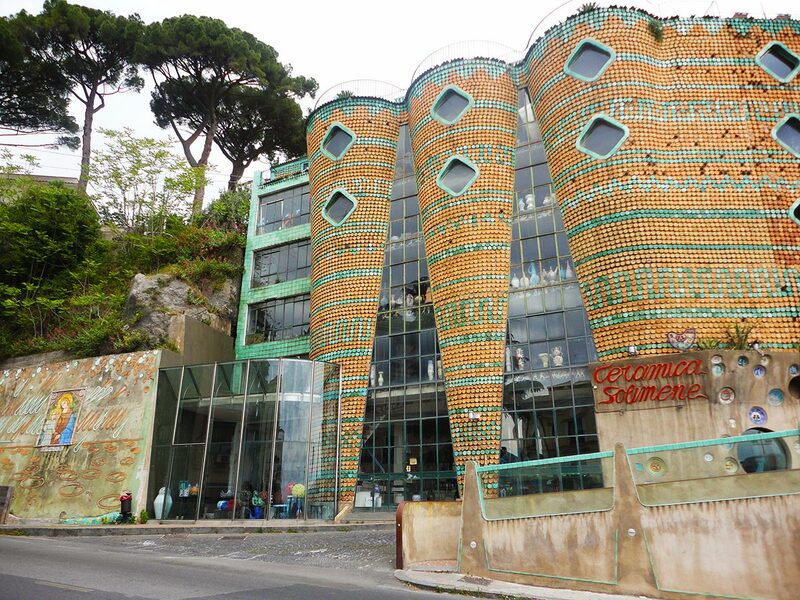 In addition to his must-see shop and studio, you can’t stop in Vietri without visiting the town’s towering ceramics factory, Ceramica Artistica Solimene, an architectural landmark of the city since 1954. The Ceramica Solimene, a monument to Italian ceramics. Celebrating the ceramic tradition, which dates back to the 15th century in Vietri (some argue it started even earlier), the factory makes and holds thousands of ceramic pieces in a multi-floored, mosaic-covered building. Gaining momentum in Europe and worldwide, they have been invited to exhibit at prestigious international events, including at the 2012 London Olympics. After walking through the factory, we decided to sit and partake in southern Italy’s tradition of eating an entire pizza by yourself at Divina Vietri, a local gourmet pizzeria that specializes in award-winning, seafood-topped pies. 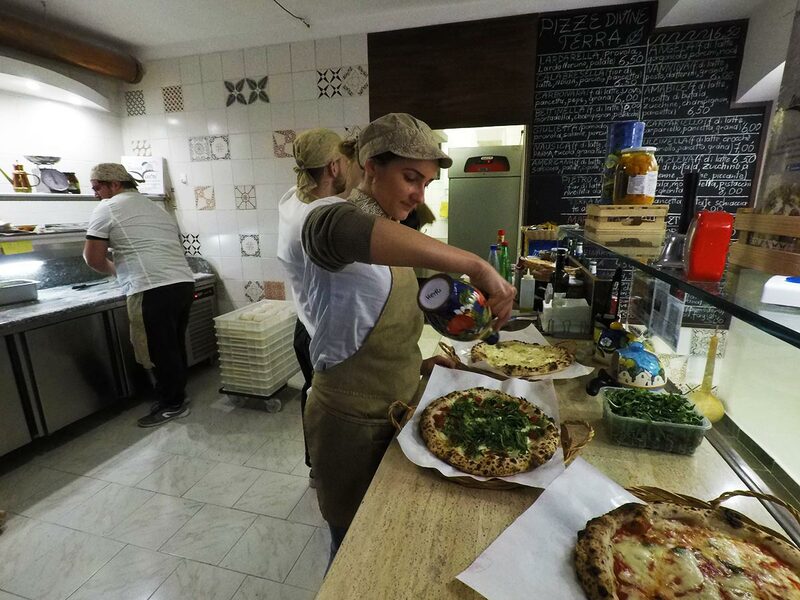 Being based in Vietri, it comes as no surprise that their wood-fired oven is decorated in local tiles and there is ceramic artwork displayed on the walls, napkin holders and even on the olive-oil dispensers. Look closely and you can see the ceramic art covering the olive-oil dispenser. It’s not every day you walk into a pizza shop and straight into a city’s past, but that’s Italy for you. Lucky for us, they made a pretty delicious pizza, too.